“Oh, look Sharon is pregnant again,”—Gina said out loud, though no-one was around to hear her. She stumbled upon her friend’s blog page showing a photo that revealed the advanced stage of Sharon’s pregnancy. “That must be number seven for them”,--Gina thought, smiling down as she gently caressed her round belly. “I guess they have been keeping up,”—Gina could hardly believe that Sharon was sticking to her plan of having eight children. Sharon was Gina’s hero for many reasons, but in this particular case, for being such a sport. Pregnant Gina looked and felt like a helium filled balloon, full and round but light on her feet, with only occasional mild discomforts. Pregnant Sharon spent nine months “heavy with child” weighted down to bed and burdened with morning sickness lasting from three in the morning till two fifty at night! Gina returned to her needle and quilt. She was due in about a month and really wanted to finish the baby blanket before his or her arrival. As always she was hoping for “her”, but the blanket was turning out a bit boyish and she started dreading having to pick a boys name again. With four boys, she felt they had already used-up all the good ones. There are only a few that sound equally nice in the three languages spoken in their family -English, Russian and German. Sharon and “the Man” (as she referred to her husband on the blog) sure would have liked having another boy, as they had only one so far. Nevertheless, so many girls gave Sharon the chance to outdo herself in making the cutest girly knits. Her Wool and Chocolate blog had no entries on cakes or cookies, as the name might insinuate. Knitting was as sweet as chocolate for Sharon and any time she was not home schooling her kids, cooking or washing, she spent knitting or spinning. Gina and Sharon had a lot in common. They shared their views on nutrition; organic only, no additives, no partially hydrogenated oils, no glucose syrups, aspartame or fluoride. Both women used cloth diapers on their babies and spared them immunizations. Neither of the women did any prenatal screenings; they loved their babies, boy or girl. Pink or blue could be decided after the birth. And besides, they both liked the element of surprise. Gina, anxious to check on Sharon’s current status, came up to the computer to find the space occupied by her husband. “Hey Gina, listen to this song,” Rob said, taking off a set of headphones and handing them to her. He was listening to a new song that his band had sent him for adding his vocal lines. Gina listened for a while. “Sounds cool, do I get a part?”—Gina had studied opera singing at the Vienna conservatory and even though Rob was in a metal band, there usually was a song on every album on which he would ask her to sing the choir. She was still patiently hoping for a part with actual words, instead of just “oh”s and “ah”s. “But I am still…” --Rob tried to protest, reaching for his headphones. ”This seat is reserved for the pregnant and the handicapped,”—she interrupted,--“I don’t see a neck brace on you,” -- outright kicking her husband out of the computer chair. As she took seat in front of the screen, Rob stood behind her and began lightly massaging her shoulders. Gina went straight to the blog page. Sharon‘s photo always popped up on the right hand side. She must have taken that picture herself, holding the camera in her right hand above the head. She was smiling, looking up straight into the camera, squinting a bit, because she had to take off her square dark framed glasses. Her hair had grown long, probably more out of neglect rather than fashion. For the same reason she was not wearing any make up. Gina admired Sharon‘s casualness with which she selected her internet pictures. Gina was quite vain about what she posted. Just like Sissi she wanted the world to remember her young and beautiful; at least younger and more beautiful than she really was. Still smiling at the photo, her attention was drawn to a post named The Worst Week of my Life which Rob had been reading over her shoulder, which she as well, began to read. “Yesterday I shared my birth story. Such a sweet, peaceful, and quick birth it was that brought The Blessing into our lives. For almost two whole days we basked in the afterglow of that birth, adoring our new little baby, beginning to understand what an extra chromosome meant to us. And then it happened. My world threatened to collapse on top of me. The diaper was filled with blood. Not a little streak …“This is as far as Gina got when she was interrupted by Rob who was quicker to read. “Ok, then you finish it and tell me what happened,”--her face still gleamed with a slight hint of the smile she had from Sharon’s picture, as it began to fade into a dropped jaw, furrowed brow expression of complete inability to comprehend what she had just read. She really appreciated her husband looking out for her at that moment. “Why don’t you go work on the quilt if you want to finish it in time”,--Rob said as he took the chair and continued reading. Gina quoted Scarlet O’Hara to herself, “I won’t think about it today”, -- and walked away counting her blessings. Gina was tossing and turning in bed. At that stage of pregnancy it was almost impossible to lie in bed comfortably. Only this time it was not just the inconvenience of the unproportionately huge belly. There was some pulling and cramping in combination with back pinches. Gina counted--twelve days before due date. She returned to thinking about Sharon and her baby. Rob had told her that everything ended well and that the baby was safe and sound and already at home. However, the image of that diaper filled with blood kept coming back. Was that somehow connected to the chromosomal augmentation? She remembered the exact words: “what an extra chromosome meant to us.” To the rest of the world it means Down syndrome. Gina had worked with such kids before and knew that having one was not necessarily a sad thing. It also seemed like Sharon and the family were taking it well. Still, Gina was not sure what the appropriate thing to say would be. What would be the appropriate thing to even feel? “I guess, no one dreams of having Down syndrome babies,” –she decided that a touch of pity would be appropriate. She started a bath, like she always did when she had to check the seriousness of the contractions. These ones proved to be real but she decided to try to get some more sleep and went back to bed. She managed to snooze a bit. A couple hours later she opened her eyes, shook off the sleep and decided it was time to run the bath. Only Gina’s firstborn was delivered in a hospital, the rest of the children were born at home in all kinds of combinations: with and without midwifes, on a mattress and in water. She swore on the latter, but wanted to do something different this time. She had even looked up “unassisted birth” on you-tube and was determined to do just that—have her baby entirely alone. She told him just to stay in bed for now, and went to make some bath tea. The sun was not up yet, and it was too chilly outside to search for garden herbs, so she searched the kitchen for dried lavender and roses and whatever herbs she could find and put them into a big pot of boiling water. Rob knew that at this point she is better off left alone; she would call him if she needed his help. He appreciated her self- sufficiency and sovereignty in child bearing, not to mention the extra sleep this would afford him. Besides, he did not like feeling like a fifth wheel—a sensation unavoidable for any man in presence of a birth giving woman. Gina poured the tea into the deep bath. She had a flash back of walking into this bathroom during the first tour of the house and thinking how nice it would be to deliver a baby in this gorgeous room with faux marble tiles. She felt grateful that they were able to get this wonderful place two years ago which she coveted to christen with at least one more baby. She sat the empty pan on the window sill. From here she could see the stork nest. Storks came every year, previous summer they were able to observe baby storks from hatching to learning to fly. The storks came back in the spring, only this year none of the eggs hatched, probably drowned in the heavy rains of the early summer. Gina stepped into the tub. In an attempt to avoid thinking about bad omens she focused on being fortunate not to depend on the weather for her babies to survive. She immersed into the water which immediately rose to fill the sitting corner of the Jacuzzi tub. The top of the belly with a popped out belly button was distorted by a contraction. The warm water engulfed her sagging limp body. The sent of lavender dominated all the other herbs. If only she could take a half and hour time out and get some more rest! She relaxed her jaw, her mouth half opened. “As above so below”,--she visualized opening gates, unfolding rose buds and dilating cervixes. She concentrated on her breathing sending the air all the way down to her lower back. Between the contractions which were now coming about every five minutes she was able to doze off. A couple of hours later little Annie woke up and asked for her morning cocoa. Rob got up. Interpreting the moans and breathing that he heard on his way to the kitchen he presumed that he would not be going back to sleep. “Should I call the midwife?” –he asked on the way back down the hall toward the bathroom. They both new she would not make it there on time, but this had been Gina’s plan to begin with. “Sure, go ahead,”-- she was expecting to enter the second, most unpleasant stage of birthing, but instead of the familiar painful contractions she got the urge to push. She did not think it could get any better than her labor with Annie, but obviously there was always room for improvement. After the third push it was over. She lifted a blue and very tiny baby out of the water. A pair of little dark pearls was staring past the mother’s face. “Rob!”—the intensity of her holler surprised her. Having just gone through labor she did not expect to have any strength for a cough, let alone for such a shout. “What can I do?”—thinking the birth was about to begin, Rob opened the bathroom door to help with the delivery. A waft of roses and lavender startled him for a moment. Right then he saw the little blue creature. “Oh my…” As he knelt down to take the tiny baby into his hands, he saw the umbilical cord wrapped around the neck. Twice, they realized as they unraveled it. The baby was completely limp and not breathing. “Breathe, baby, breathe!” Gina and Rob looked at each other helplessly at a loss for what to do. All three of them were holding their breath. “Come on baby, breathe, breathe,”—Rob gently pleaded. A faint cry finally came out. Two sighs of relief followed. Gina looked down and confused the navel part of the umbilical cord for another body part, so she was very surprised to hear Rob say that it was a girl. She got out of the water and sat down on the corner of the bathtub holding the tiny infant tight to her breasts. All babies look strange when they are just born. It takes some time, even if only a few seconds, to recognize them as your own, because they look somehow foreign, nothing like one might have expected. But this one looked plain alien. Gina kept staring at the baby’s eyes. Rob handed her a towel and left the room. He returned promptly with a camera in his hands already explaining to the future viewers the date and the occasion. He walked around to be able to get a good shot at the baby, he zoomed in and through the camera screen for the first time was able to take a close look at his baby girl. “Does she look,” – he paused for a second, “downish?”—he continued not sure if he used the right word. Gina nodded. Now that her suspicion was confirmed her heart was frozen in shock. She felt neither sadness nor fear, neither remorse nor disappointment. How could one have any feelings about a parcel that got delivered to a wrong address? This is what was going on in her head, just a bunch of thoughts detached from any kind of emotion: “A mistake, that’s what it is. I am young and healthy, I had done no ultra sounds, and therefore this cannot be happening to me.” The fact that she was going on forty that summer thus putting her in the “risk group” had no relevance at that moment. She knew that Down syndrome was not a sickness which could have been caused by any events during pregnancy. She tried to go back to the day and the circumstances of the conception. She was pretty sure it took place on New Years which also happened to be her birthday. She was about to have a sense of guilt about being quite tipsy that night, but since guilt is a feeling, her numb heart did not allow for it. “Ok, we can deal with this, but how on earth am I going to tell my Mother? I swear I will stop talking to her if she only stammers about it being a result of me not baptizing my children.” Just then she remembered Sharon: “No way! What are the chances? !” Talking about kindred spirits: for both it was the seventh baby, both had a home water birth, both without midwifes, both ended up with girls (they even were given different variations of the same name), both had their babies in the same month—this alone should have sufficed for a plot of a book or a movie. But if one were to write in such a book that both babies also had Down syndrome! This was beyond mere coincidence! “Sharon never drinks, they are steadfast Christians”, thinking of her friend annihilated two possible reproaches at once. “That’s kind ‘a cool. Unbelievable, but cool”,--she actually felt honored to share such fate with her admired friend. Gina tried to imagine how Sharon would react to such news. At that moment she was feeling closer to her friend on the other side of the world she ever had. Deep down in her heart she already knew that a Down syndrome baby was not a curse but a blessing, not a punishment but a gift. Rosa, the oldest of now three girls, cut the umbilical cord. The afterbirth was left in the drained bathtub for the midwife to examine and the whole family convened to the master bedroom. The kids were gently squabbling over who gets to hold the baby. Gina was considering if she should mention anything to the children. Rob went to google the characteristics of Down syndrome: “Maybe her eyes were just puffy from the birth…” On the chart of common responses to a traumatic event, he was currently in denial. She was entering the mourning stage, imagining how beautiful the baby’s eyes could have looked like. “Did all your babies look like this?”—the midwife asked. She had arrived an hour after the birth and was already finished with the routine check up of the new born. Her obvious attempt at being as delicate as possible catapulted Gina and Rob into the next stage -- confrontation. “Do you mean Trisomy 21?”—Gina used the medical term to show she had everything under control. When a new child is born, life never stays the same. There are more worries, more challenges, but also more joy and a lot more love! With Mascha life is THE BEST! ist eine Privatschule mit Öffentlichkeitsrecht für Kinder und Jugendliche mit und ohne Be­hinderungen von 5 bis 15 Jahren. 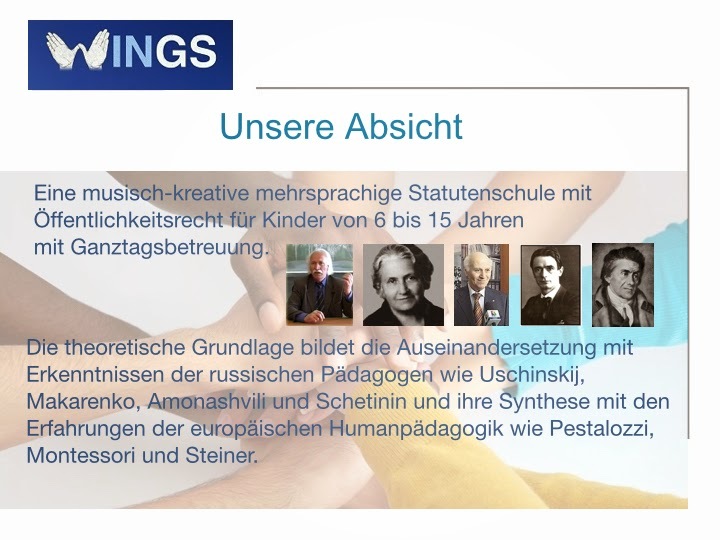 WINGS ist eine mehrsprachige Schule, wobei Deutsch und Englisch die Arbeitssprachen sind und Russisch als lebende Fremdsprache angeboten wird. 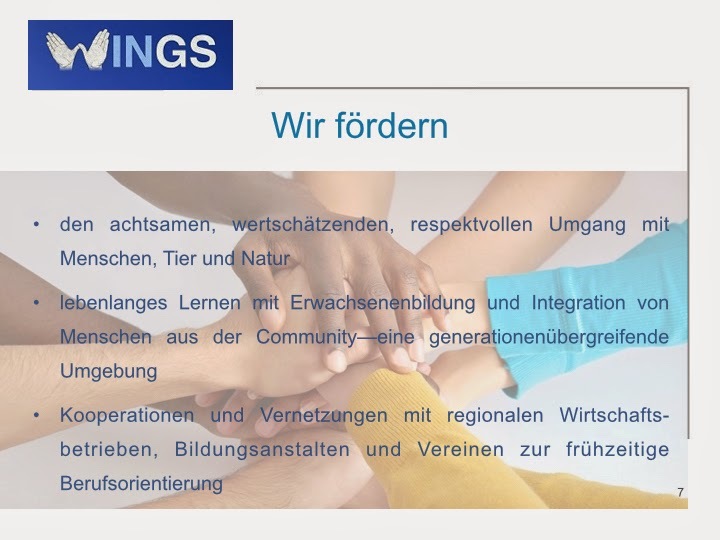 Schulerhalter ist der Verein „WINGS“, Verein zur integrativen und kooperativen Förderung von Kreativität und Begabungen bei Kindern und Erwachsenen, welcher von Genia Lackey und Devon Graves gegründet wird. In Zukunft sind sowohl die Kinderbetreuungseinrich­tung als auch die Maturabegleitung geplant. 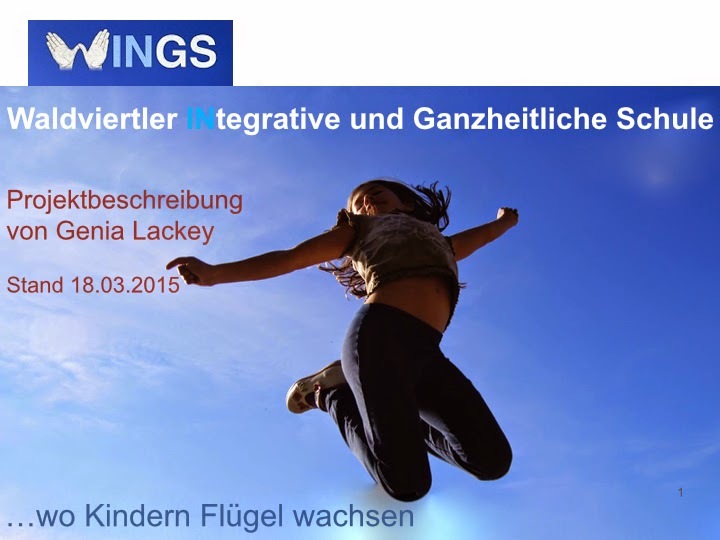 Genia Lackey ist sowohl Urheberin des pädagogischen Kon­zeptes als auch die Schul­leiterin. In vielerlei Hinsicht neuartige Vision der Schule basiert auf der multikultu­rellen Lebenserfahrung der gebürtigen Russin. Nach dem Abschluss ihres vierjährigen Ba­chelor Studiums am Grinnell College in den USA übersiedelte sie nach Österreich, wo sie am Konservatorium der Stadt Wien Sologesang studierte. Seit 8 Jahren bietet sie Eng­lisch für Kinder mit „Programm Show Me The World“ so wie Russisch- Unterricht mit von ihr selbst entworfenen Lernunterlagen. 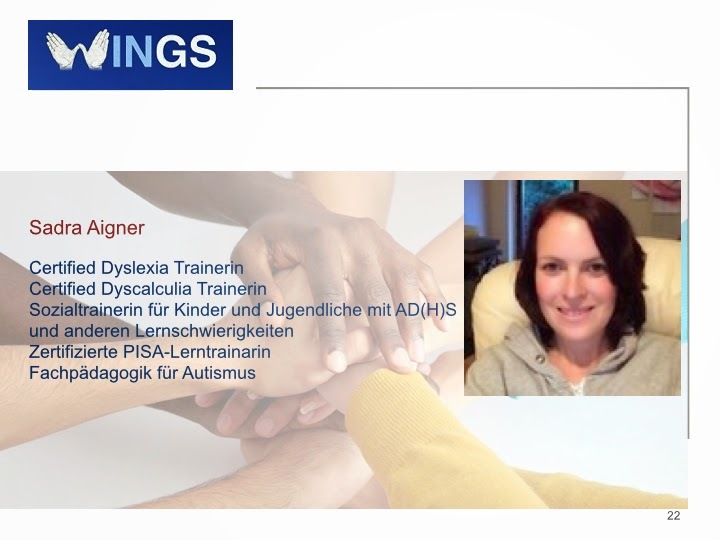 Als siebenfache Mutter schließt sie im Februar 2015 ihr Bachelor of Education Studium (NMS Englisch und Musik) an der KPH Wien/Krems ab. Für das Schuljahr 2014-15 ist sie für die Montessori Diplom-Ausbildung bei BEL Montes­sori angemeldet und macht parallel die Laising Ausbildung bei Dieter Graf-Neureiter. 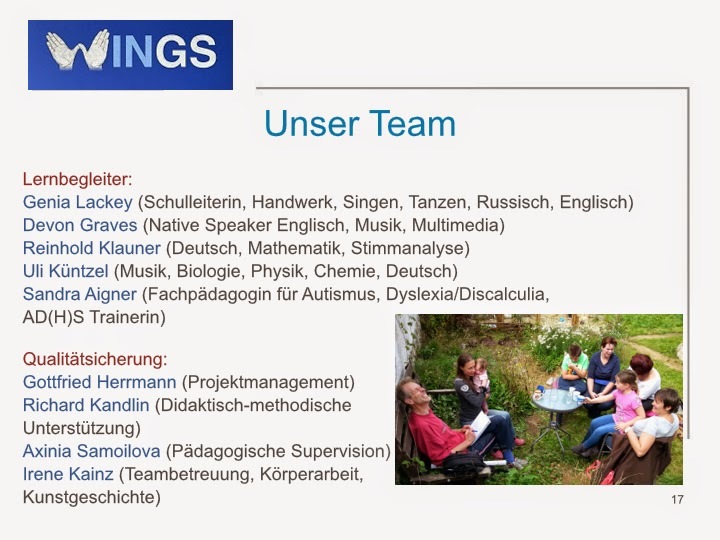 Ihr Mann, Devon Graves, ein aus Kalifornien stammender Rockmusiker, wird in der Schule als Native Speaker und musikalischer Leiter fungieren. Ein weiterer Pädagoge mit Deutsch als Muttersprache wird vom Verein ange­stellt. 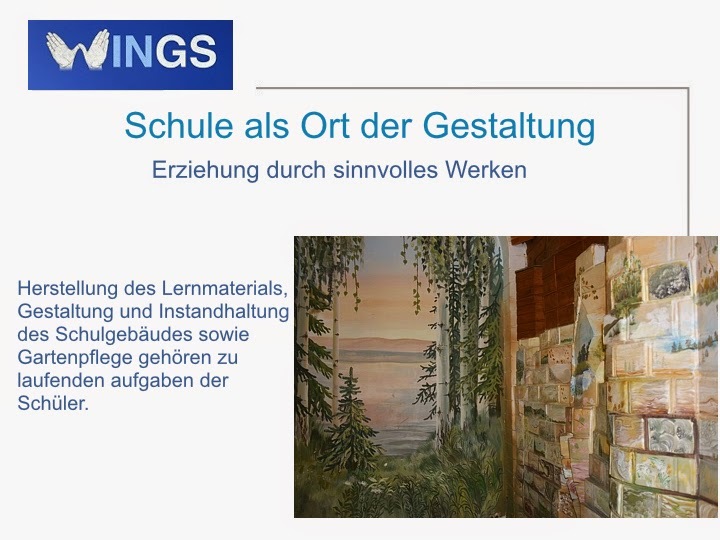 · Begegnung mit dem Lernmaterial—wobei die Erstellung des Lernmaterials und die Vorbereitung der eigenen Lernumgebung (im Gegensatz zu Montessoripädago­gik) zum schulischen Alltag gehören. Solch eine Mitgestaltung der eigenen Umge­bung ist für die Entwicklung von Selbstwirksamkeitsgefühl von großer Bedeutung. · Begegnung mit Menschen ist, allerdings, die wichtigste der Begebenheiten. Was eine Schule ausmacht ist die Summe aller Beteiligten. WINGS soll sowohl von Innen nach Außen, als auch von Außen nach Innen offen bleiben. So können Kinder aus anderen Schule sowie Erwachsenen an den Nachmit­tags­modulen teilnehmen. Das Lernen von einander und mit einander sowie Aus­tausch zwischen Generationen sind wichtige Aspekte der menschlichen Begeg­nung. Ganzheitlich heißt—das Kind als Ganzes zu akzeptieren. Die Lehrer verstehen sich als Begleiter des Kindes, die dem Kind einen Raum geben, seinem natürlichen Lerndrang nachzugehen und seinen Forschergeist auszuüben. Es gibt keine Leistungsbeurteilung durch Noten. Aus den Fehlern wird gelernt und auf den Erfolgen wird aufgebaut. 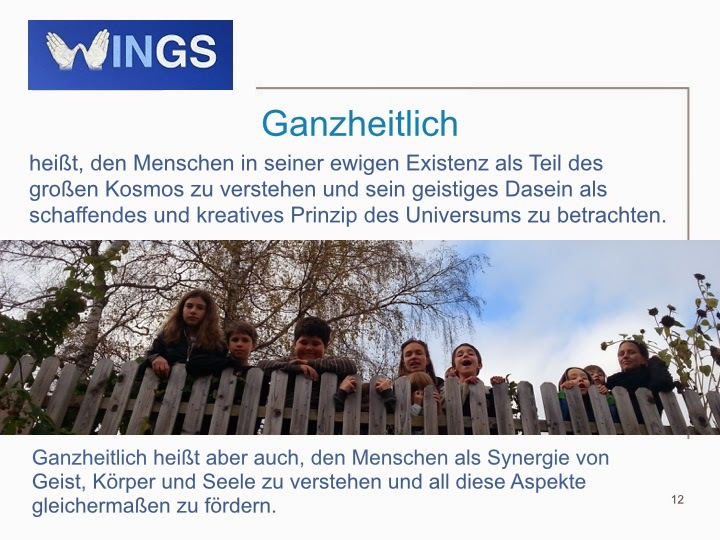 Ganzheitlich heißt aber auch, den Mensch als Synergie vom Geist, Körper und Seele zu verstehen und alle diese Aspekte durch laufende Yoga, Kreativtanz, Gesang, geführte Meditationen, Bildnerische Gestaltung, Energieübungen zu stärken. Gesunde biologische Ernährung bei den gemeinsamen Mahlzeiten versteht sich von selbst. Ganzheitlich heißt vor allem, das Lernen vom Leben nicht zu trennen: Im Lernen zu leben und im Leben zu lernen. Der Begriff INtegrativ beschränkt sich nicht auf die Integration von Menschen mit besonde­ren Bedürfnissen (jedes Kind, jeder Erwachsene haben ganz besondere Bedurfnisse! ); Menschen mit Behinderungen sind in WINGS willkommen und werden nach Prinzipien der INklusion behandelt. 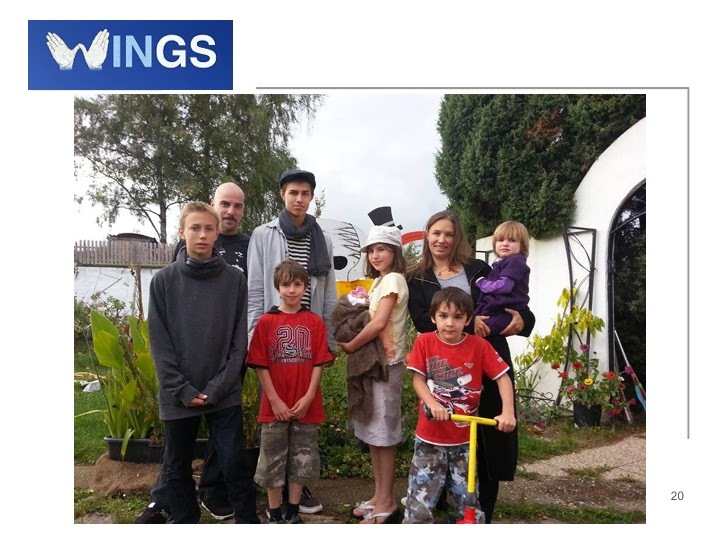 Rudolf Steiner und seine Waldorfpädagogik, Reggio-Pädagogik, Ideen von Pestalozzi und Maria Montessori, Rebeca und Mauricio Wild, sowie viele inspirierende Ansichten von Andrè Stern und Michail Schetinin. · als auch die finanzielle—Förderungen, Sponsoren, Wettbewerbe—die WINGS für El­tern leistbar machen und die Integration von Menschen aus unterschied­lichen so­zialen Schichten versichern. · und auch kommunikative/kooperative - Vernetzungen mit verschiedenen Wirtschaftsbetrieben Bildungsanstalten und Verei­nen aus der Umgebung trägt zur zeitigen Berufsorientierung und Begabungs­förderung bei. Wo befindet sich die Schule? Im wunderschönen wohltuenden Waldviertel, und zwar mit­ten in seinem Herz—in Allentsteig. Aus verschiedenen Gründen ist dieser Ort in der Ver­gangenheit in Verruf gekommen. Wonach Allentsteig in 10 oder 20 Jahren bekannt wird, hängt davon ab was hier heute passiert. 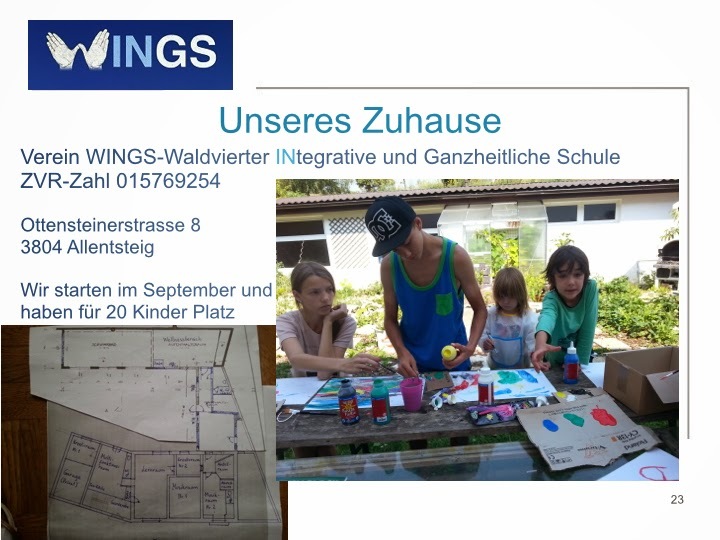 Projekte wie lichtspiel und WINGS verheißen Allentsteigs Zukunftsfähigkeit, machen Allentsteig für junge Familien interessant und schaffen heute schon ein neues Image für diese Stadt, unsere Heimatstadt! 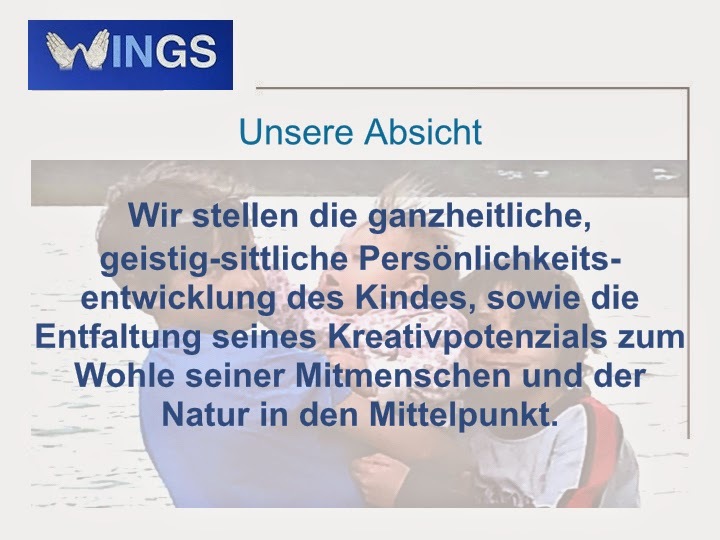 Begabungsfördernder Unterricht zielt daraufhin die Potentialentwicklung jedes Kindes zu ermöglichen. Obwohl begabungsförderndes Lernsetting in jedem Fach angefordert wird, bietet gerade die Kombination aus Englisch und Musik als Haupt- und Neben-Fach besonderes viele Möglichkeiten für Individualisierung im Unterricht—einer der wichtigsten Voraussetzungen in der Begabten- und Begabungs-Förderung. 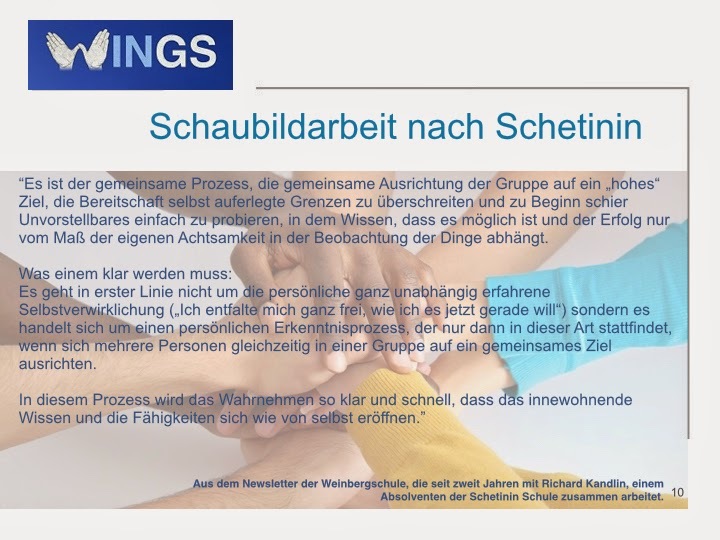 Individualisierung bedeutet für die Autorin vor allem die Grundhaltung der Lehrperson jeden Schüler und jede Schülerin in ihrer Einzigartigkeit wahrzunehmen und ihre individuellen Stärken durch einen differenzierten Unterricht zur Geltung zu bringen. 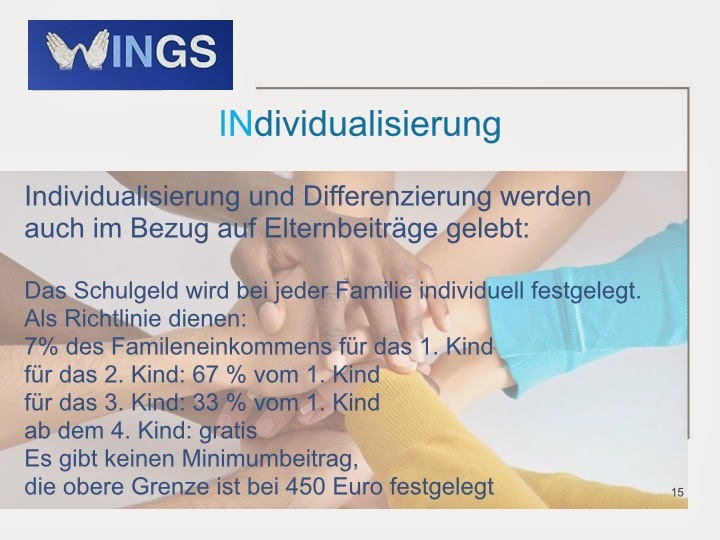 Diese drei Faktoren: die Grundhaltung der Lehrperson, Individualisieren und Differenzieren sowie Stärkenorientierung sind die drei Säulen des begabungsfördernden Unterrichts. Man könnte sagen, dass sich die zwei letzteren Faktoren aus dem ersten ergeben. Somit ist die richtige Grundhaltung des Lehrers, der Lehrerin von unverkennbarer Bedeutung. Ein solcher Lehrer bzw. eine solche Lehrerin ist ein Coach und Mentor, der statt richtigen Antworten richtige Fragen parat hat, die die Schüler und Schülerinnen zu ihren Antworten führen. Ein Coach, der eine Vielfalt und somit divergentes Denken fördert und die Kinder in ihre Persönlichkeitsentwicklung unterstützt, ein Mentor der den Lernenden Mut macht Fehler machen zu dürfen und den eigenen Lernprozess reflektieren zu lernen. Ein Fachmann, der in eigenem Fach zwar viel weiß, aber noch mehr wissen will und die Schüler und Schülerinnen mit seiner Neugier anstecken kann. 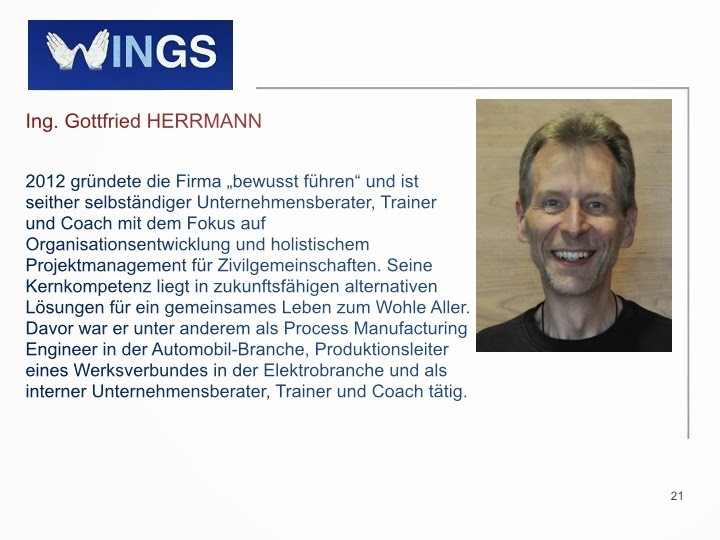 Differenzieren bedeutet in diesem Zusammenhang eine breite Palette an Unterrichtsformen (von Frontalunterricht über Lernschachteln und Stationenbetriebe bis Frei- und Projekt-Arbeiten), Sozialformen (Einzel-, Partner-, Gruppen- Arbeit), Unterrichtsinhalten (Aufgaben die verschiedene Multiple Intelligenzen nach Gardner berücksichtigen und unterschiedliche Interessen bedienen) und außerdem eine breite Palette an Lernzielen, die das ganze Spektrum von Wissen, Verstehen, Anwenden, Analysieren, Synthese und Beurteilung (Taxonomien des Lernens nach Bloom) beinhalten. Im Bezug auf Besonderheiten des Englisch-Unterrichts lässt sich anmerken, dass gerade hier ein fachübergreifender Unterrichten und somit große Interessenförderung möglich ist. Zum Beispiel wäre es möglich den Schüler und Schülerinnen am Anfang des Jahres Themen aufzuschreiben, die im Unterricht behandelt werden sollen. So könnte man auch gemeinsam die Kapitel des Buches die niemanden interessieren wegstreichen, damit mehr Zeit für die kurzweiligen Inhalte bleibt. Differenzierung der Lernziele würde es erlauben innerhalb eines Themas bzw. eines Kapitels zwischen verschiedenen Leistungs- und Fähigkeits-Niveaus zu individualisieren: während eine Gruppe sich mit den neuen Vokabeln eines Textes beschäftigt, kann die andere Gruppe den Text zusammenfassen, einstweilen die Dritte einen eigenen Text mit den aktuellen Vokabeln schreibt. 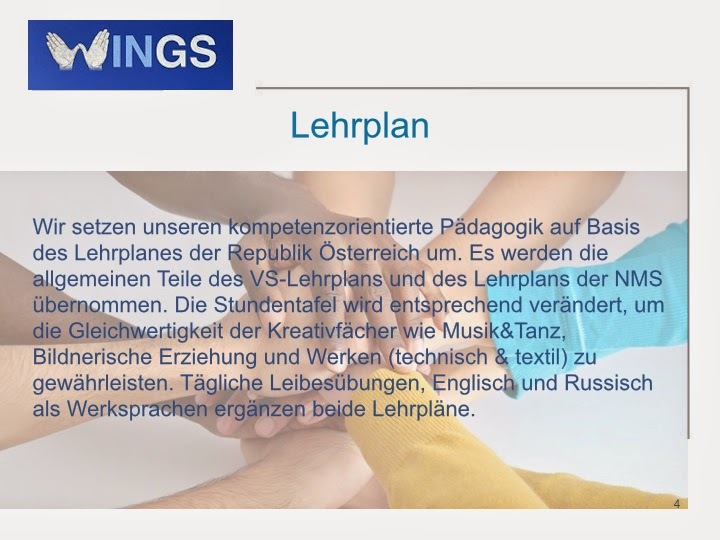 Klippert Methoden, Experten Gruppen, Lernwerkstatt, Lernen durch Lehren, Projektmappen und Talente-Portfolios lassen sich im Englischunterricht besonders gut implementieren. Auch Musikunterricht lässt sich sehr frei und flexibel gestallten. Hier scheint es wichtig, an der modernen Musikwelt der Jugend anknüpfen zu können, um sie zum Singen zu motivieren; Schüler und Schülerinnen mit einer andersartigen (z.B. klassische) Musik zu konfrontieren, ihren Eindrücken einen Ausdruck verleihen zu lassen. Auch der moderne Kreativtanz und die vielfältigen Möglichkeiten seines Einsatzes fördert verschiedene Intelligenzen wie körperlich-kinästhetische, musikalische, visuell-räumliche, inter- so wie intra- personale. 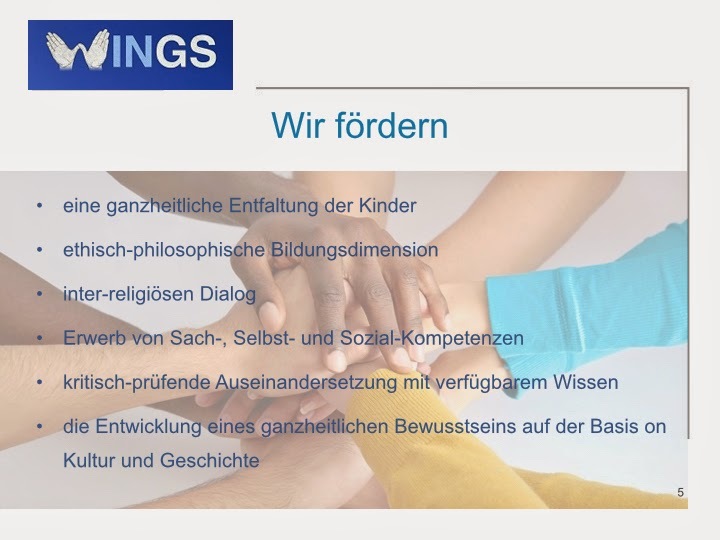 Musikunterricht bietet viel Raum für philosophische Diskussionen, ästhetische Bildung und Selbsterfahrung. 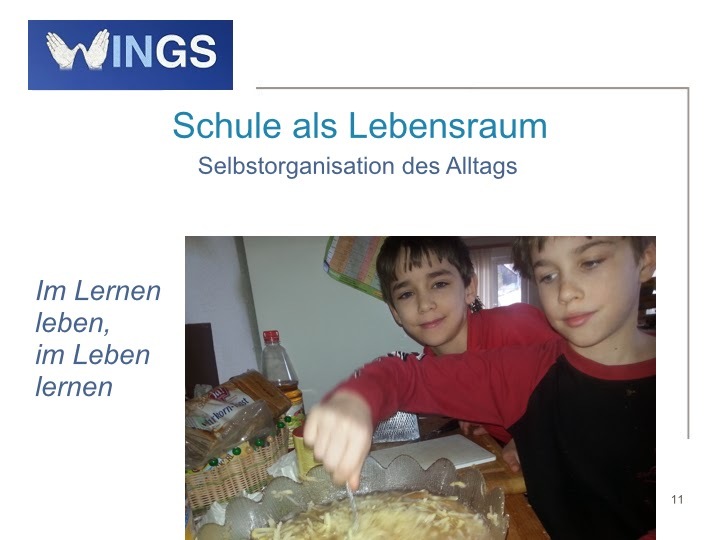 All das bringt die Schüler und Schülerinnen an das vorrangige Ziel der Begabungsförderung, nämlich an die Entwicklung der Persönlichkeit des Individuums (vgl. BMUKK-10.060/0130-I/4b/2009, 2). Zusammenfassend lässt sich sagen, dass die Grundhaltung der Lehrperson die größten Chancen aber auch die engsten Grenzen mit sich bringt. Es ist wichtig die Kinder als die nächste Stufe in der Evolution zu betrachten die potenziell fortgeschrittener und weiser als wir sind, um sie mit entsprechendem Respekt behandeln zu können. Maya Angelou is perhaps one of the most extraordinary personalities of the twentieth century. A dancer, an actress, an author, a screenwriter, a poet, she has multitudinously earned the title of “the fist black woman”. Just to name a few, she was the first African-American woman to have a non-fiction best-seller with her autobiographic novel I know why the Caged Bird Sings which came out in 1969. In 1972 she became the first black woman to have her screenplay produced, when her drama Georgia was made into a movie. However, the first “first” goes back to the WWII years, when she was the first black female cable car conductor. Her latest “first” and conceivably her most commendable one, yet, was the recitation of her poem “On the Pulse of Morning” at President Bill Clinton’s inauguration in 1993. The audio version of this extraordinary, highly inspirational and utterly eloquent poem/speech won (very much justified) Grammy Award for the best spoken word album. The appeal to ethics is followed by pathos in the second stanza as the Rock cries out to us, clearly, forcefully … reiterating two verses down in anaphora: the Rock cries out to us today… as the Rock urges the humans to rise to their intended position—only a little lower than the angels, and stop hiding and crouching face down in ignorance. The Rock is willing to serve the Human as a pedestal—you may stand upon my back… you may stand upon me (anaphora)—as the Creator intended for the human to be the crown of his creation. The song of the River appeals to logic; the attempts of profit maximization of the businesses has led to exploitation and pollution, it is time to try something new, not war, but peace, not against nature, but with it. The Tree, on the other hand, uses more pathos: bought, sold, stolen, arriving on the nightmare praying for a dream. It invites the listener to come to the riverside: plant yourself beside the River…root yourselves beside me. In this case the author employs the technique of chremamorphism-- giving characteristics of an object to a person. Through the personification of natural objects and bestowing humans with qualities of a plant the author accentuates the inseparability of mankind, nature and their creator. However, mankind still needs to give birth…to the dream of unity. So far humans have built the wall of the world and have bordered [their] countries, they have led armed struggles for profit…--desperate for gain, starving for gold, bought, sold, stolen, arriving on the nightmare praying for a dream. It seems noteworthy that the author never uses collective terms like humans, people or mankind. Maya Angelou either uses the direct “you” or very specific categorisations of the seventh stanza (the Asian, the Hispanic, the Jew et.c, by the way this is the only stanza which is written in rhymes: Jew—Sioux, Greek—Sheik, Preacher--Teacher) or the metaphor each of you, descendant of some passed on traveller. This line evokes an image of a prodigious son, whose Father is patiently waiting for him to come back and plant and root himself back at home. Home in this particular case is the Rock, the River, the Tree. Notice, the Rock is not defined by its color, the River is given no name and the Tree is not classified either. The ancient Chinese teaching of Feng Shui states that the energy chi which lives in all things manifests itself in five different expressions which are also called the Feng Shui elements. These are Water, Wood, Fire, Earth and Metal. It seems as though Maya Angelou intentionally leaves out the elements of Fire and Metal out of her poem. These two elements have been abused by mankind for the purpose of destruction. It is time to restore the balance. It is time to come home. One could argue that it was the original task of a human—Adam’s job—to give names to all things. To give names and define their purpose, yes. But the humans got too caught up in name-calling and forgot their perhaps most important purpose—the “molding of the dream”. The beginning of any creation is logos—word, image, or a dream. Full of pathos Maya Angelo urges the listener to give birth again to the dream. Using the device of a metaphor she persuades women, children, men, [to] take it into the palms of your hands, mod it into the shape of your most private need, Sculpt it into the image of your most public self. This is a deeply philosophical paragraph. The author is using very powerful images/metaphors to stress the importance of what is being said, for example, “to give birth to the dream”. As already mentioned, a dream or an idea is the very beginning of creation, be it a creation of a work of art or conceptualisation of ones own destiny, the image precedes its materialization. The birth is on one hand the very beginning of something and on the other hand it is the ultimate act of creation in terms of materialization. From this perspective the phrase “give birth to the dream” could be considered a pleonasm as if saying “let us go to the beginning of the origin”. In this particular case such pleonasm does not sound redundant, but rather provides the necessary graveness to the point. And then of course there are “your most private need” and “your most public self” which are indispensable to the poem. The “public self” is relatively easy: it is the best version of ourselves, our super-ego if you will. But what is the most private need? It can only be speculated that the need that Maya Angelou is talking about is the need for freedom, not in terms of human rights or civil freedoms, but the essential need to be free from expectations and prejudices, free from burdens of the past and free from fear. In fact the word courage is used twice in the poem, History, despite its wrenching pain Cannot be unlived, but if faced With courage, need not be lived again. This is what Maya Angelou said about the virtue of courage: "Courage is the most important of all virtues, because without courage, you cannot practice any of the other virtues consistently." The last four stanzas contain a lot of non consecutive anaphors, such as Lift up you eyes,… lift up your hearts; You may have the courage,… you may have the grace. No less to Midas than the mendicant, no less to you now than the mastodon then. To look up and out and upon me, the Rock, the River the Tree, your country… to look up and out and into your sister’s eyes, and into your brother’s face, your country. The latter constitutes the climax, the high point of the poem, because now the listener, who was still all the way down on the ground in the beginning of the poem, has now risen to the proper for a human heights (only a little lower than the angels) and can look upon the country which is made up of the Rock, the River and the Tree (the natural endowment) as well as the brothers and sisters (the people that populate the country) with a sense of freedom and equality and face the new morning, a new beginning with hope and optimism. When Maya Angelo finished, her dream was born in the hearts of all who listened. 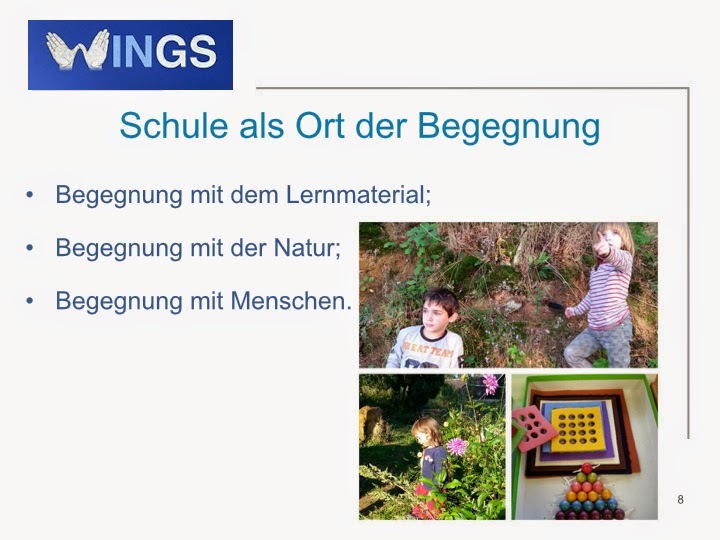 Es ist keine Montessori Schule, obwohl Kinder mit Montessori Materialien arbeiten werden und im eigenständigen und eigenverantwortlichen Lernen geübt werden. Es ist keine Waldorfschule, auch wenn Epochenunterricht (Themenblöcke) zum Grundstein der Jahresplanung wird. Anthroposophie von Rudolf Steiner widerspiegelt viele meiner Prinzipien der ganzheitlichen Weltanschauung. Es ist keine „Wild“ Schule (Pesta von Rebeca und Mauricio Wild), dennoch wird WINGS dem selbst-bestimmten Lernen viel Freiraum lassen. Es ist keine Freinet Schule, jedoch wird die Anfertigung der Unterrichtsmaterialien von Schülern ein unentbehrlicher Teil des Lernprozesses wird. Es ist auch keine Regelschule, obwohl sie sich nach dem Lehrplan orientiert. Was eine Schule ausmacht ist eigentlich die Summe aller Beteiligten. Ich kann der Schule eine Richtung vorgeben. Die Schüler/innen, Lehrer/innen und Eltern werden sie mitsteuern. Ich freue mich auf jeden Fall auf die Reise. Auf das, wie die Schule tatsächlich wird, bin ich sehr neugierig. 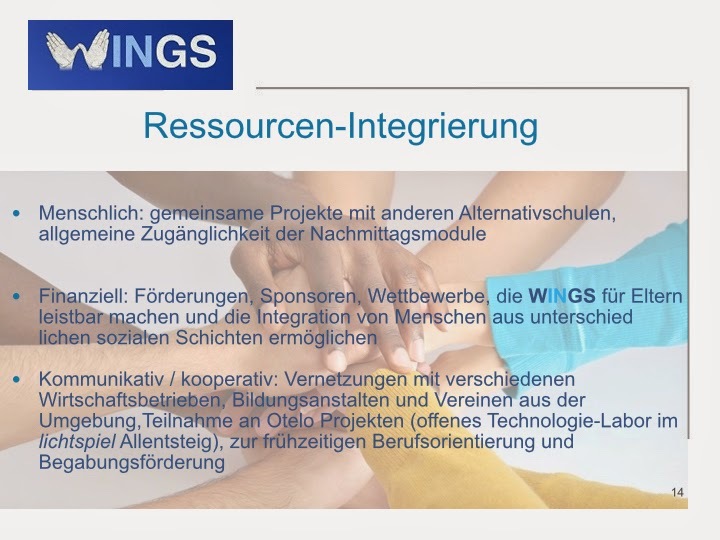 Eines kann ich aber jetzt schon versichern: WINGS wird ein Ort der Begegnung sein; Begegnung mit Materialien, Begegnung mit der Natur aber, vor allem, Begegnung mit Menschen! WINGS--Waldviertler INtegrative und Ganzheitliche Schule. This blog is dedicated to my latest infant—the one I have been pregnant with for the past twelve years (ever since my oldest son started school)—my vision of school. These pages will lay bare the circumstance of the conception of my ideas. These pages will convey the pains and contractions of a school founding. These pages will disclose the unraveling of the umbilical red tape. These pages will enunciate groans of frustration and utter cries of joys of success. There might be some sighing and panting or huffing and puffing. I deeply hope that this blog will guide us through the experience of an inimitable birth of a unique body of persons and its journey as it surmounts the horizons carrying everyone envolved on its WINGS. Genia Lackey. Design "Einfach". Powered by Blogger.